NYC, 05/23/2019, 2:00PM. 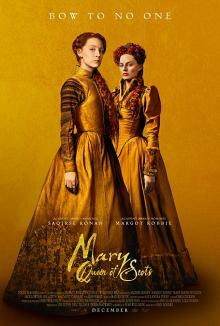 Mary Queen of Scots (2018): Two Time Oscar Nominated Power Struggle Between Cousins. 124 min. Director: Josie Rourke. Starring Saoirse Ronan, Margot Robbie, Jack Lowden. Mary Queen of Scots two nominations for Best Costume Design and Best Makeup and Hairstyling at the 91st Academy Awards. For her performance, Robbie earned nominations for a SAG Award and BAFTA Award for Best Supporting Actress.